CAMBRIDGE (UK), February 2019 — Think of the egg and sperm as information capsules with stored instructions for starting a new life. But post-fertilization, what kickstarts the interpretation of these instructions? Researchers at the Babraham Institute in Cambridge have provided further pieces of the puzzle by using a rare subset of mouse embryonic stem cells that provide a “lookalike” system to the two-cell embryo (zygote) occurring 24 hours post-fertilization in pregnant mice. This is the stage at which the zygotic genome is normally activated. Using these cells, called 2C-like cells, the researchers could probe the hierarchy of molecular events taking place to initiate the zygotic genome. Their research findings are published in Genes & Development. Waking up the genome occurs through events called the minor wave and major wave. Researchers knew that a transcription factor (a protein that binds DNA to promote expression) called Dux activated a range of genes in the second major wave, but not what initiated Dux or the genome activation in the first place. 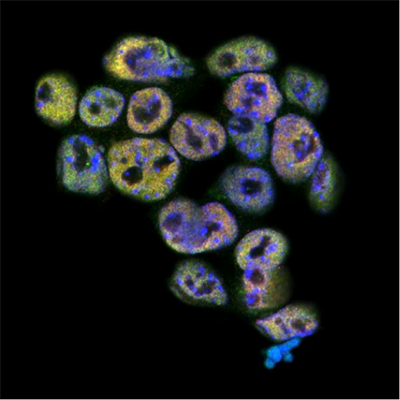 Merged image showing a colony of mouse embryonic stem cells fluorescently stained for Dppa2 in red, Dppa4 in green and DNA in blue. Image courtesy of Dr. Melanie Eckersley-Maslin, Babraham Institute.